Last weekend, I was quite successful in my first attempt to become the bartender of my household. I made mojito, a traditional cuban drink, out of fresh ingredients. I got the recipe from Bacardi. How flattered I was when Indi and Yodhi complimented my mojito! Although the recipe asks for Rum, you can make the drink as virgin mojito, and it'll be thirst quenching for hot Singapore weather. However, today I tried to make a hot variation of mojito, which would better suit for cold climate/weather. This one is without lime juice. 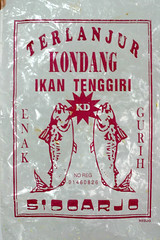 We brought back a few packs of krupuk (fish crackers) from Indonesia. Later I realized that the brand of the particular fish cracker was quite funny. Take a look here. This recipe is adapted to suit the availability of ingredients here, and to suit my unwillingness to spend five hours making gumbo broth.